The 960 model features the 3-Stage Cleaning System and tangle-free extractors. It can work for up to 75 minutes on a single charge, then dock, recharge automatically, and continue the cleaning process after that. It is smartphone compatible and can be programmed using the iRobot HOME app. Rank: #4 out of 281. Rank: #2 out of 281. Avoids bumps, stairs and can clean hard-to-reach areas. 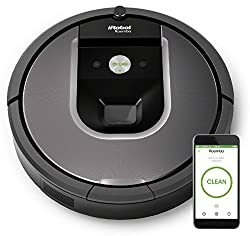 The Roomba 960 seamlessly navigates any area around the house without any hassle, it can be navigated with an app so cleaning and scheduling can be done anytime and anywhere. Equipped with cliff-detection sensors so it won't fall off the stairs, balcony or any other dangerous drop offs. However, its bin is small so homeowners with pets or kids may have to regularly empty the bin though there is an option to continue cleaning even if bin is full. Irobot Roomba 675 is a very popular and one of the more expensive options. It's in the top 3 bestselling robotic vacuums and has dozens of popular alternatives in the same price range, such as Eufy RoboVac 30 or Hoover Rogue 970 . 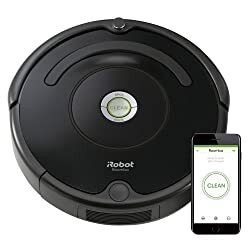 Irobot Roomba 675 is $20.99 more expensive than an average robotic vacuum ($249). Roomba 960 seamlessly navigates room to room to clean an entire level of your home, recharging and resuming until the job is done. Roomba 960 is a top selling option at the top of the price range. It's a #1 bestseller in robotic vacuums category and has dozens of popular alternatives in the same price range, such as Xiaomi Mi Vacuum Cleaner or Imass A3-VBL . Roomba 960 is $189.16 more expensive than the average robotic vacuum ($249).